There are two main concerns when a horse has to carry a heavy rider. One is the overall weight, of course. The other concern is how much AREA is distributing the weight. A horse can often carry about 20% of his own weight. For a 1000 pound horse, 20% would be 200 pounds, rider AND tack. A very fit horse or a stout horse may be able to carry more; some breeds were specifically bred to carry heavier weights, such as the Arabian, Quarter Horse, or Icelandic pony. If a horse is made to carry too much weight, you may cause damage to his bones or skeletal structure; extra force as he moves may also cause damage to his tendons and ligaments. If you are asking a horse to carry a heavy weight, then it is important to make sure that he can carry the overall weight; it is also important to make sure that the weight is well distributed over his back. Pressure is Weight divided by Area (Pressure=Weight/Area). 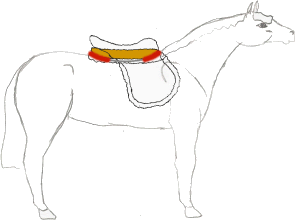 The more area carries the weight, the less the pressure will be at any individual spot (of course, the saddle must fit, and have no pressure points). Too much pressure on the surface of the skin can cause rubbing, chafing, or can slow the circulation to the muscles under the skin. Slowing the circulation to the muscles can cause oxygen deprivation in the muscle, which leads to muscle damage and muscle wastage. Studies are not yet definitive, but it appears that a safe maximum pressure is 2 pounds per square inch. If a rider and saddle together weigh 150 pounds, then the surface of the saddle, where the panels or the bars touch the horse, should be at least 75 square inches. Calculate the pressure on your horse's back; click here. An English tree is very light, but is also very small. The majority of the weight of the saddle and rider is carried over the tree. 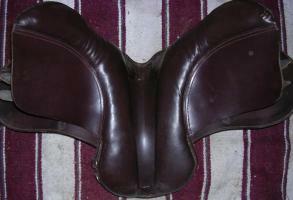 The panels of the English saddle help distribute the weight of the rider and saddle. Overall, the weight bearing surface of the English saddle is on the two panels, each typically about 3"to 4" wide by 16" to 20" long (this can vary a lot depending on the width of the panels, and the length of the tree). Overall average is about 120 to 130 square inches. For a rider who weighs 120 lbs, plus a saddle that weighs 10 lbs, on an average English saddle, the Pressure on the horse's back would be about 1 pound per square inch. That would be nicely within the limit. However, a heavier person in a smaller saddle would press much more on the horse's back. If the rider and the saddle together weigh 230 lbs, and the saddle is a smaller 17" saddle (panels about 3.5" by 17"), then the Pressure would be 230lbs / 119 square inches, or 1.9 pounds per square inch. That's getting pretty close to the maximum--and this is assuming that the saddle fits very well, with the whole surface of the panels touching the horse all of the time. If the saddle doesn't fit well, then the surface area is much smaller. 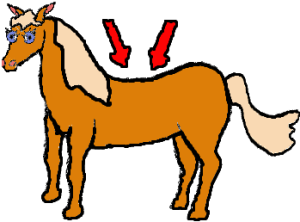 If the saddle "bridges" (doesn't touch in the middle, which is a common problem) then the area touching the horse is much smaller. Depending on the severity of the bridge, the surface touching the horse could be as little as one third the actual surface--the pressure on the horse could be three times as much as you think! It is always important to be sure that your saddle fits your horse well. However, if you are using a small saddle, or are asking your horse to carry a heavy weight, then your horse's health may depend on having a properly fitted saddle. For more information about muscle damage, see Equine Therapy. A Western saddle has a very different weight distribution. Even a small Western tree has much more of its surface touching the horse. The average surface area of just the Western tree is about 180 square inches; that's half again the average of an English saddle tree. So, pressure-wise, an average Western saddle can easily handle 1 1/2 times as much weight as an average English saddle. Just as the panels help distribute the weight on an English saddle tree, the skirts help distribute the weight of a Western saddle tree. So the Western saddle can actually distribute even MORE than 1 1/2 times the weight of the English saddle. In order for the skirts to help distribute the weight of the saddle, they must be stiff enough to carry some of the weight. They must also be touching the horse. Some Western saddles are badly designed, causing the skirts to drag along the horse's spine (painful) but to sit off the horse's sides. And again, of course, the saddle must fit well, or the saddle won't touch the horse all along its surface. The bearing surface only distributes weight when it does touch the horse. If the saddle doesn't fit well, then you cannot depend on the bearing surface to be large enough. Some saddles combine the English and Western trees. 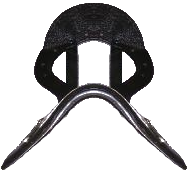 An endurance saddle or an Australian saddle, might be lighter and have a seat like an English saddle--but will have a larger bearing surface, like the bars of a Western saddle. 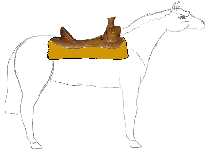 Some varieties of military or police saddles actually have a fixed Western-style tree under an English saddle-shaped seat. The Western tree is hard and solid, so it may be somewhat more uncomfortable for the horse without the buffering of the skirts. 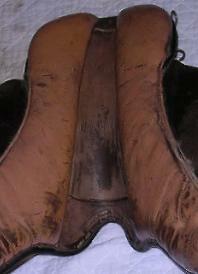 Some Western saddles are being made with fiberglass trees which are much lighter. These unfortunately also seem more prone to crack, and/or to have short bars that make the surface tiny. Be careful, when buying a lighter saddle, that the saddle is well designed and sturdy as well as lightweight. Each saddle, whether English, Western, or a hybrid, should be examined individually to be sure that the bearing surface is both large enough, and comfortably designed, for the horse. As in most cases, a "nice thick pad"
The Western saddle can be terrific for helping to spread weight over a large surface. It can really help a horse who is carrying a heavy weight. A Western saddle isn't the idea solution for every horse/rider combination. Disregarding saddle preferences (where some riders are just happier in other saddles), some horse simply can't carry a rider in a Western saddle. Arabians (who, as noted previously, can often carry larger weights) tend to have short backs. The weight of the saddle must rest behind the shoulder, and in front of the hip (usually about a hand's width in front of the hip). Since Western saddles have an extended bar and then skirting on top of that, many Western saddles will simply not fit on an Arabian's back. The saddle will end up propped up on either the hip or the shoulderblade, and there will be bridging as a result. Arabians aren't the only horses who often have short backs. A short back is often structurally more strong than a longer back, but those short backed horses may not be able to accomodate a Western tree. In theory the horse should be able to carry a fair amount of weight, but weight distribution may be a problem. If you can't put a saddle on the horse that keeps pressure below 2 pounds per square inch, you may not damage the skeleton...but you may damage the muscles. More narrow panels Some English saddlers pay careful attention to the weight bearing surface. The panels on all their saddles will be wider and spaced well for carrying weight. 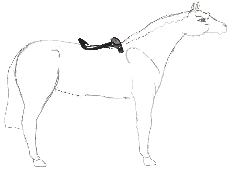 Often a dressage saddle (of whatever make) will have longer, wider panels. Not all, of course, but quite a few dressage saddles have been designed to spread weight well. A saddle with a narrow twist or a narrow seat width at the cantle may have very narrow panels underneath to compensate. Jumping saddles or close constact saddles can be particularly susceptible to the narrow panels. It's important to pay attention to the surface that touches the horse, to make sure that it is suitable. This can be tremendously difficult; when ordering a saddle from a catalog or website (or eBay), how often does the ad have a picture of the underside? Even the popular name brand saddles may vary from year to year, so you can't just order the same brand/make of saddle that you've seen elsewhere, and expect it to be the same. Consistency is difficult to find.